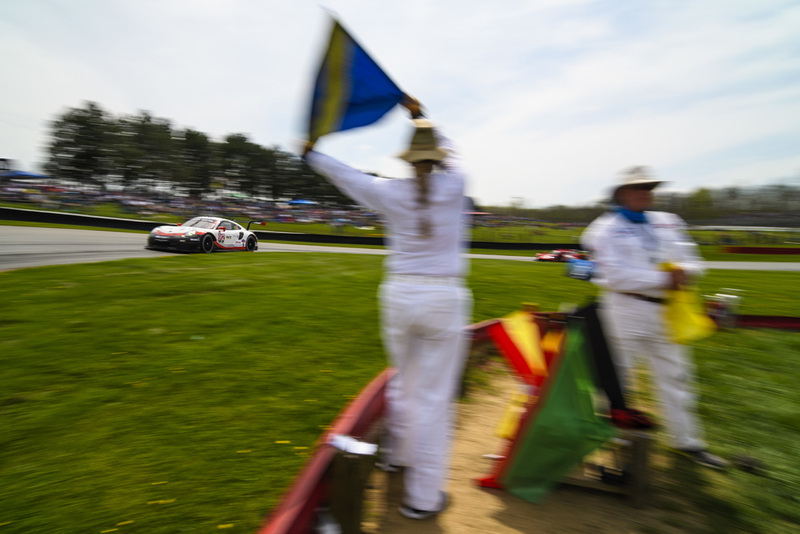 The Porsche GTLM class factory IMSA effort secured victory this weekend at Mid Ohio Sportscar Course, making this their second win across the first four races of the season. That's a pretty good ratio for any racing team, but to hold that distinction in as competitive a class as GTLM, Porsche has to be beaming. Competition from Ford, Chevrolet, and BMW had Porsche in fits across the full two hours and forty-five minutes of the race, but they ultimately held on to keep a hard charging BMW at bay in the last handful of laps, winning the race by just 1.673 seconds as the checkered flag fell. It was an exciting race, from flag to flag to say the least, especially considering there were no full course yellow laps. During Porsche's pre-tests at Mid Ohio in mid-April, the weather turned sour and they experienced snow and freezing winds for two days. Because of that, the team had no viable data with which to build their race. Mid Ohio has been off the IMSA calendar for at least long enough that this would be the 911 RSR's first race on the midwest circuit. Because of that, and the fact that it was a warm and gorgeous day on Sunday at the track, the team was forced to work doubletime to figure out a setup for the race. Laurens Vanthoor and Earl Bamber set the pace for the weekend, putting down fast lap times in each of the three practice sessions. In Qualifying, however, it was Nick Tandy who put Porsche on the outside pole, sharing his car with Patrick Pilet. Tandy got a great start and took the lead of the class on the first lap. Earl Bamber, who also had a killer start, put his car right behind Tandy's wing and stuck there. At the first pit stop, Bamber swapped out for Laurens Vanthoor. With Pilet now in for Tandy, the pair ran in lock step until the next pit stop. Pilet was struggling to keep pace with the field on his new set of tires, and was forced to leave Vanthoor at the front as he drifted further to arrears. As the BMW, on fresher tires, closed in during the final phase of the race, Vanthoor knew that this was his opportunity to finally take a victory for the team. He'd managed his tires well, and was able to find a slim margin on which to finish ahead.